Ever considered getting married on a Greek island? If not, you could be missing out on the ‘must-visit’ wedding destination of the last decade. Here are just five of the millions of reasons you should tie the knot on a Greek island! First up, let’s just talk about the weather. Greece is one of those places that is pretty sunny all year round, but never gets too hot that you can’t breathe. If you get married on an island, then you’ll also be treated to the sea breeze to cool you down in your wedding dress. Opt for April, May or September as perfect Greek wedding months. Want to get married on a beach? How about a tiny, white church with an eye-catching blue roof? What about in an amphitheater? One of the best things about getting married on a Greek island is that you can pick from plenty of stunning locations, that you and your guests certainly won’t forget in a hurry. Imagine the photos! If there is one thing the Greeks do best, it’s food. You can expect a ‘family meal’ style of dining if you get married in Greece, which basically means a LOT of food. They will bring out plenty of dishes throughout your wedding meal, meaning no one will ever get hungry. Plus, most Greek islands serve up fresh food that has been farmed or caught by locals. If it’s a long flight to a Greek island for you, then how about combining your wedding with your honeymoon? Bring all of your guests over for a few days of fun, before sending everyone home and spending some downtime with your new husband or wife. You could even go island-hopping if you want to see more of what this stunning country has to offer. It may seem strange to think that a destination wedding is cheaper, but hear us out! 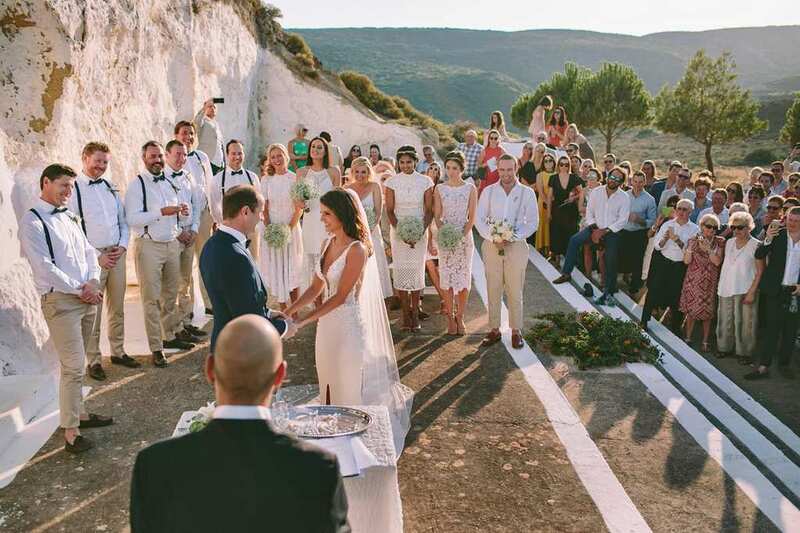 If you’re willing to stock up on Euros to take over to pay suppliers, and everyone gets their own flights and accommodation, you may find it a lot more cost effective to get married on a Greek island. Especially if you combine wedding and honeymoon, too! If you hadn’t considered a Greek island wedding before, perhaps some of these reasons will change your mind. As the Greeks would say… Yamas!